The B126-1A0 is an active extender remote unit for the B126-002 (2-Port) and B126-004 (4-Port) HDMI Over Cat5 Extender/Splitter local units. When using 24Awg, Solid Wire Cat5e/6 cable (Tripp Lite N202-Series), the B126-1A0 can extend a 1080i (60Hz) signal up to 200 ft.; or, a 1080p (60Hz) signal up to 150 ft.. An Equalization setting is built-in to the unit, allowing for adjustment of the video image. When used with a B126-002 or B126-004, both stereo audio and 7.1 channel surround sound audio are supported, as well as HDCP protected content. Mounting hardware is included, allowing the unit to be rackmounted, wallmounted or pole mounted. Compliant with the Federal Trade Agreements Act (TAA) for GSA Schedule purchases. 1 year limited warranty. The B126-1A0 is a receiver unit that is used with the B126-002 and B126-004 transmitter units. It extends a 1080p (60Hz) signal to a monitor up to 150 ft. away using Cat5e/6 cable. To achieve maximum distance and resolution, use 24Awg Solid Wire Cat5e/6 cable. (Tripp Lite's N202-Series) It features a built-in Equalization control for adjustment of the video image. Supports 24-bit True Color (8-bits per channel), HDCP, 3D, and both stereo audio and 7.1 channel surround sound audio (7.1 channel surround sound signal will be Multi-Channel or PCM). Installation is simple. 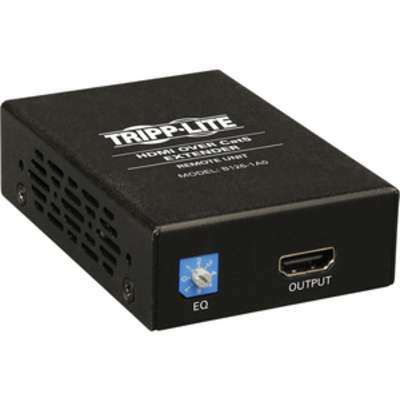 Connect the transmitter unit to an HDMI source using a Tripp Lite P568-Series HDMI cable (not included). Connect the receiver unit to a display using a Tripp Lite P568-Series HDMI cable (not included). Finally, connect the receiver to the RJ45 port on the transmitter using a single Cat5e/6 cable. Compliant with the Federal Trade Agreements Act (TAA) for GSA Schedule purchases.